Welcome to the country! You will enjoy watching the wildlife from this gorgeous half acre on tidal creek, just a short boat ride to the Nassau River, a 1/2 mile to Holly Point Boat Ramp. This renovated mobile home has cedar log siding, sits 10' above 3000sf of concrete, includes a work shop. 250'+ of bulkhead on marsh & tidal creek with a dock, great for the kayak/fishing/boating enthusiast. Perfect for entertaining guests on the wood deck with beautiful views of the marsh. Gray upgraded vinyl-plank flooring throughout living/dining & wet areas. Kitchen includes new stainless appliances, granite counter-tops, subway tile backsplash compliments the kitchen. 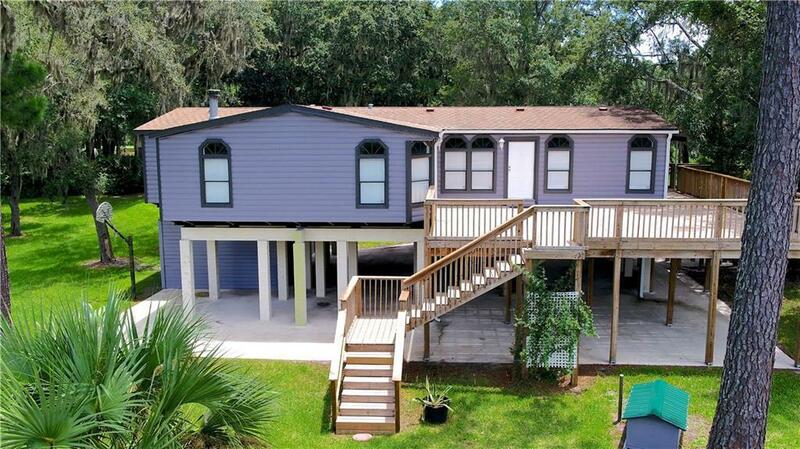 Master BR includes large walk-in closet & windows to enjoy the view of deck and Marsh. Master bath has a garden tub, walk in shower and gentleman height counter-tops. Improvements include new paint in/out, plumbing fixtures, lighting fixtures, blinds, door hardware, ceiling fans & more! Don't miss your chance to own this unique home!